Hevna boasts a wide and varied geography, with creatures of all colors and stripes adapting to make the most of the range of environments. Like with our world, the flora and fauna of Hevna have developed to exploit any resources or energy available in a region, evolving with time to best suit the surroundings and food sources available… including aether. Creatures exploiting aether are typically known as ‘Magus’ breeds. Read on for some information about some of Hevna’s more unusual species. Reptiles have traditionally had a very successful time on Hevna, colonizing near every continent save the very coldest. Of these, Crawlers are the largest land reptiles to have adjusted to the different terrain of Hevna. Whether dealing with the green crawlers of Rasaal, the blues of Arlatene’s mountains or the reds of Okan’s lava fields, all crawlers are about a man’s height to their shoulders, walk on all fours and can be used as beasts of burden… so long as one if careful of their breath. Crawlers are among the lesser of Hevna’s Magus breeds but are able to use aether in the right circumstances. Typically found in regions where aether naturally accumulates in storm years, Crawlers consume rocks and crystals to aid their digestion, and turn the aether into either a stunning jolt from an organ in the top of their mouths or to exhale heated or cold breath in defense of themselves and their nests. Solved by simply muzzling domesticated beasts, or ensuring no aether is available in their diet, Crawlers are used the world over for their great strength in order to move large loads. Weasels, stoats, and ferrets have been very successful across a wide swathe of Hevna and may be found in abundance in all of its wooded areas and beyond. Appearing in a range of sizes and colors to suit their environments, some species have also adapted to use aether in their hunting. Magus ferrets are typically larger than their mundane counterparts and can make excellent pets. Already a smart species, some Magus varients seem to possess an even greater intellect than average, displaying the ability to follow commands and even count. Regarding their use of aether, most species use the resource to mask their own scent or noise, create distraction noises and lights, or blur their own outline while hunting. 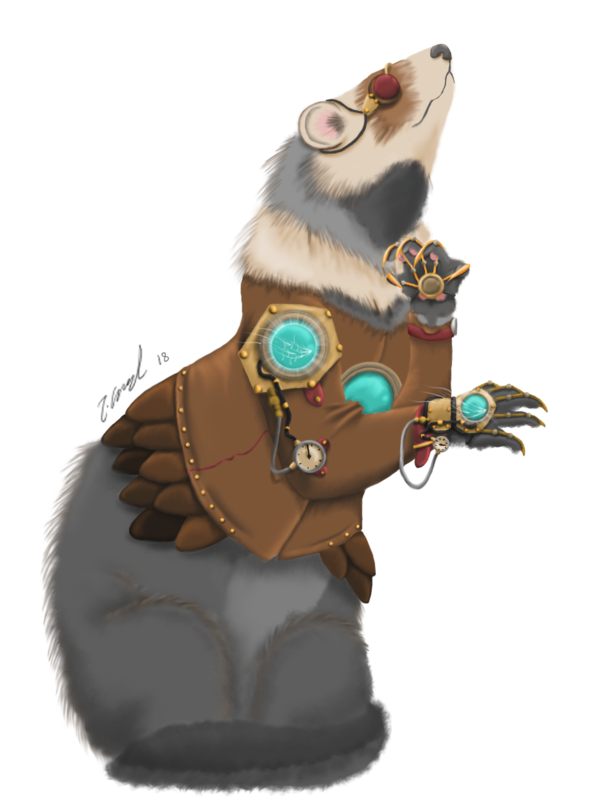 While the common or mundane ferret operates well in small groups (called a ‘business’), Magus ferrets tend to be solitary and territorial. On Earth, the Peryton is rumored to be a mythological being with head, neck, forelegs, and antlers of a stag, combined with the plumage, wings, and hindquarters of a large bird. Sometimes, they appear as a deer with wings, and they are entirely fictitious. 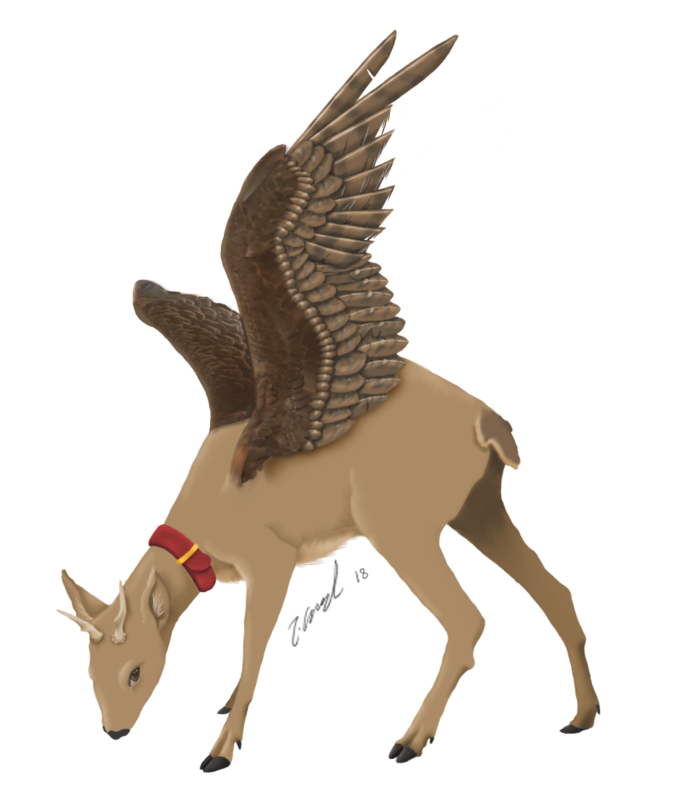 On Hevna however, the Peryton is one of many Magus creatures of the forests, and while it looks like a deer with wings, it is inherently more complicated than that, on the inside. Light boned creatures with air sacs and hollow bones, Peryton’s are universally herbivorous, flighty and rare. Thanks to human impact on the once wide-ranging forests of Hevna, Peryton’s are now found only in small populations around the densest forest areas of the world. Prized by trophy hunters, some populations of grey and white Peryton are now believed extinct, though the brown Peryton of Arlatene survives in the Pendesfern forest. In the Autumn, the Peryton rut alongside their deer cousins, though their semi-aerial displays are somewhat more comedic to behold. Dragons. They fascinate people. Akin to other places, the people of Hevna have a rich and storied history of tales about the king of reptiles, and the Lodaist faith uses the great beasts as heralds of their beliefs. Dragons are awe-inspiring and almost magnetic. Which makes it a double shame that the only living species anything like a Great Dragon, the Wyrm, is nothing at all like the stories. Subspecies of wyrms exist the world over, varied in color and some structural makeup, but all of them are light-bodied flyers. Mostly carnivorous, these flying reptiles have mastered the air currents of Hevna and can be seen in many regions, often in flocks. While many scientists currently classify them as some form of off-shoot from the Crawler lineage, (wrongly), one thing is for sure – despite their grace and elegance in flight, they are entirely unsuitable to be ridden by men. Hard to tame or train, made of slender and delicate bones and wing membranes and secreting powerful scents to mark their territory, wyrms fill a variety of niches in their local ecologies. Some subspecies even seeming to be adapting to ever-expanding city life among Men and Nagu. Often quite clever and cunning, especially for reptiles, wyrms are alternately revered or reviled depending on local culture and how many trash cans the critters have gotten into in the last year. Despite this, some are highly sought after for their scent glands, with the oils therein used in perfume factories.